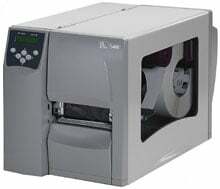 Zebra S4M - Thermal transfer printing, 203 dpi, 4" print width, Ethernet/Serial/USB interfaces, Peeler, Real-time clock. Includes US power cord. Interface cables sold separately. The Zebra S4M is designed for budget-minded users who need maximum production.The S4M features both 203 and 300 dpi print resolutions, multiple interface options (including serial, parallel, USB, Ethernet and 802.11b wireless connections).The side-loading design makes adding labels and ribbon fast and easy, and a full 8" label roll capacity means refills are needed less often. The S4M uses a durable metal case, making it ideal for warehouses, shipping and receiving facilities and other locations requiring durable construction.For both thermal transfer and direct thermal printing at a cost-effective price, the Zebra S4M is the ideal choice. Replacement Printhead Kit, 300 dpi, Compatible Printer Model S4M. This is a Zebra printer repair part. The Zebra S4M00-2011-1210T is also known as ZEB-S4M0020111210T	or S4M0020111210T	.